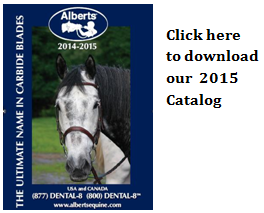 Terms and Conditions: Albert's Equine Dental Supply, Inc.
We appreciate the trust you put in Alberts. Your credit card information, your address and phone number are sensitive pieces of information. In return we promise that we will never give, sell, or otherwise transmit this information to any other party. Your credit card information is perfectly safe when you order through our web site. There is a little icon in the shape of either a padlock or a skeleton key on the bottom of your browser which assures you that any data sent to and from your computer from that page is encrypted and is safe.